Celebrate innovative engineering and design from one of the world's leading car manufacturers with this stunning LEGO® Technic model. Developed in partnership with Dr. Ing. h.c.F. Porsche AG, this elegantly packaged LEGO Technic Porsche 911 GT3 RS with its sleek aerodynamic lines, adjustable rear spoiler and orange bodywork is packed with authentic features and functions that capture the magic of the iconic supercar, and the attention to detail is clear from the outset! Open the doors and you'll discover an elaborate cockpit with racing seats, working gearbox, steering wheel with gearshift paddles, detailed dashboard and a glove compartment containing a unique serial number. Lift the rear lid and you'll have access to a detailed flat-6 engine with moving pistons, while under the hood you'll find a storage area with suitcase. Red suspension springs, detailed brake calipers and original-design rims with special low-profile road-gripping tires add the final touches to this magnificent model! Price is 10% below the initial Lego retail price, a € 33.11 discount! This comes down to 10.98 cent per brick. 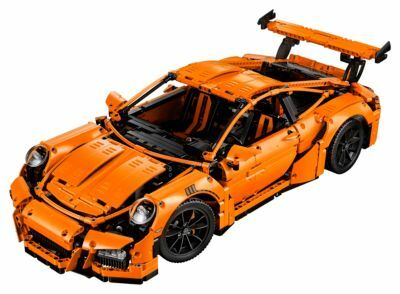 The Porsche 911 GT3 RS (42056) Lego set is no longer directly available from the sites below. However, 3rd party partners of these sites might still have the set available. Alternate description Build the LEGO® Technic Porsche 911 GT3 RS, featuring highly detailed bodywork, rims, brake calipers, cockpit and flat 6 engine, plus opening doors, hood and rear lid.